"You’ll be free or die a slave." Harriet Tubman, a runaway slave from Maryland who became known as the "Moses" of her people, helped slaves attain freedom in Canada and the northern states. As a young woman, she had experienced the cruelty and inhumanity of slavery firsthand when she refused to help an overseer whip another young slave who had gone to the store without permission. When the offending slave tried to run away from his punishment, the overseer threw a heavy iron weight at him. It hit Tubman (known then by her birth name “Araminta Ross”), nearly crushing her skull, leaving a deep scar, and causing seizures which she endured for the rest of her life. You’ll be free or die a slave. The Underground Railroad was the network used by enslaved black Americans to obtain their freedom in the 30 years before the Civil War (1860-1865). The “railroad” used many routes from states in the South, which supported slavery, to “free” states in the North and Canada. Sometimes, routes of the Underground Railroad were organized by abolitionists, people who opposed slavery. More often, the network was a series of small, individual actions to help fugitive slaves. Stations were added or removed from the Underground Railroad as ownership of the house changed. If a new owner supported slavery, or if the site was discovered to be a station, passengers and conductors were forced to find a new station. Spanish settlers bring slaves from Africa to Santo Domingo (now the capital of the Dominican Republic). Slaves rebel on the Caribbean island of Hispaniola, which now comprises Haiti and the Dominican Republic. John Hawkins, the first Briton to take part in the slave trade, makes a huge profit hauling human cargo from Africa to Hispaniola. Describing slaves as real estate, Virginia lawmakers allow owners to bequeath their slaves. 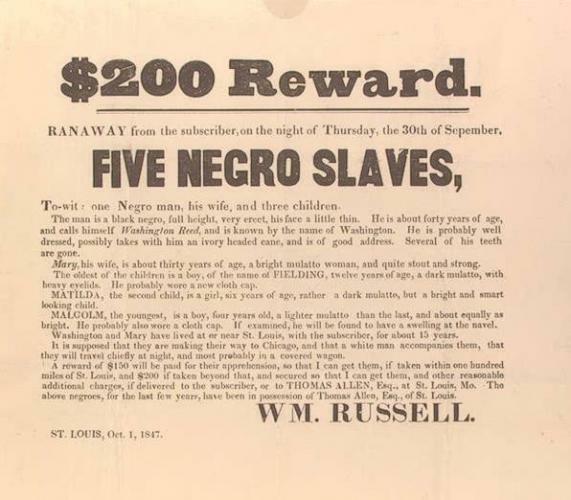 The same law allowed masters to “kill and destroy” runaways. Slaves in New York City kill whites during an uprising, later squelched by the militia. Nineteen rebels are executed. Crying “Liberty!” some 75 slaves in South Carolina steal weapons and flee toward freedom in Florida (then under Spanish rule). Crushed by the South Carolina militia, the revolt results in the deaths of 40 blacks and 20 whites. Battles at the Massachusetts towns of Lexington and Concord on April 19 spark the war for American independence from Britain. The Continental Congress asserts “that these United Colonies are, and of Right ought to be Free and Independent States”. Britain and the infant United States sign the Peace of Paris treaty.results in the deaths of 40 blacks and 20 whites. Congress narrowly defeats Thomas Jefferson’s proposal to ban slavery in new territories after 1800. Nearly 700,000 slaves live and toil in a nation of 3.9 million people. Missouri is admitted to the Union as a slave state, Maine as a free state. Slavery is forbidden in any subsequent territories north of latitude 36°30´. Freed slave Denmark Vesey attempts a rebellion in Charleston. Thirty-five participants in the ill-fated uprising are hanged. Slave preacher Nat Turner leads a two-day uprising against whites, killing about 60. Militiamen crush the revolt then spend two months searching for Turner, who is eventually caught and hanged. Enraged Southerners impose harsher restrictions on their slaves. Defeated, Mexico yields an enormous amount of territory to the United States. Americans then wrestle with a controversial topic: Is slavery permitted in the new lands? Escaped slave Frederick Douglass begins publishing the North Star in Rochester, New York. After fleeing slavery, Tubman returns south at least 15 times to help rescue several hundred others. In exchange for California’s entering the Union as a free state, northern congressmen accept a harsher Fugitive Slave Act. Harriet Beecher Stowe’s novel about the horrors of slavery sells 300,000 copies within a year of publication. Setting aside the Missouri Compromise of 1820, Congress allows these two new territories to choose whether to allow slavery. Violent clashes erupt. South Carolina secedes in December. More states follow the next year. President Abraham Lincoln decrees that all slaves in Rebel territory are free on January 1, 1863. National Geographic News: Did Quilts Hold Codes to the Underground Railroad?